The local fresh eggplants and tomatoes and peppers are disappearing for the Winter. The Farmer’s Market will soon be over, and we’ve had a few frosts that slow these warm weather-loving veggies to a halt. But before they are gone for the year, I’d like to share my version of Eggplant Tomato Melt from Prevent and Reverse Heart Disease. It’s a recipe that’s always looked good to me that I always meant to try, but when it finally came down to it this year, I felt like making a white bean spread rather than chickpea hummus for the “melt” part of the melt. White cannelini beans just seem to go with the Italian-ness of tomatoes and eggplants and peppers. I find their buttery flavor makes a good spread. And I had fresh rosemary and basil in pots just outside the back door. And then there was the summer squash from a friend’s garden. And of course leftover millet. My variations on a theme and my love of using up leftovers (and not having quite enough fresh tomato) gave me the opportunity to mix and match my veggies, and stuff a pepper in the bargain. This easy tasty spread bakes up well as the “melt” part of the layered vegetables, and it also mixes in nicely with any leftover grain or faux grain you feel like stuffing half of a bell pepper with. It’s easy and colorful and textural. Art you can eat. Here they are all “assembled” and ready for the oven. Put the garlic, basil and rosemary in the food processor and chop. Add all the other ingredients and process. Slice fresh tomatoes, eggplant, summer squash and/or zucchini. 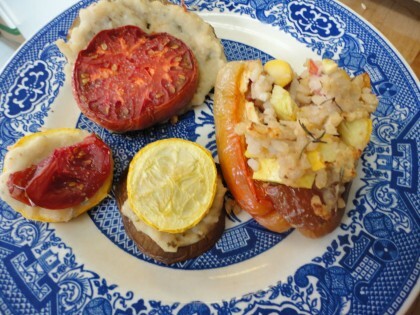 Spread the white bean “melt” on the eggplant slices or large squash slices. 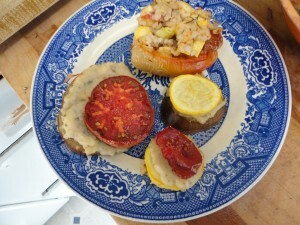 Top with tomato or smaller squash slices. Sprinkle with onion powder if desired. Bake at 400 for 20-30 minutes, until veggies are cooked and the melt, is, well, melty. Another option: mix in some of the white bean melt with a cup or so of leftover grain, herbs of your choice, and small pieces of zucchini or squash. Cut a bell pepper in half and stuff it with the mixture. 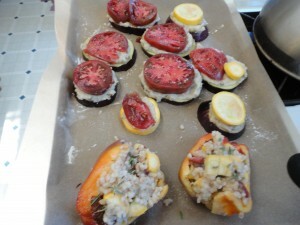 Bake along side the eggplant and tomato slices. Notes: I cook my own beans. I soak 1 cup of uncooked beans for at least 14 hours, I rinse them well in cold water, and put them in a heavy pot with about 4 cups of water and 1/4 tsp of ground fennel. The one cup of beans I used in this recipe was part of a batch like this. (Romeo likes them too, so I have to share.) I save the cooking liquid and add it to soups or use to saute veggies. If the beans are too dry you can add some cooking liquid into the food processor. If you are using canned beans, I wouldn’t recommend using the liquid from the can though. You can also sprinkle the eggplant slices with garlic or onion powder before spreading the white bean “melt” on them. And you can sprinkle additonal rosemary on top of everything before putting it in the oven. Or drizzle the tomatoes with just a little infused vinegar. I used my nasturtium vinegar–just a very little. If you can’t eat nightshades, try this with large slices of zucchini or summer squash. Or if you can eat nighshades, mix and match like I did, just because. The simplicity of this “melt” depends on the fresh ingredients. You can do it with dried herbs, too, but it might not be as vibrantly flavored. Leftover “melt” is great cut up and mixed in with greens. And if there’s a chill in the air, pour some hot broth over it and you have an instant creamy soup. In Idaho anyway, that chill is in the air. I relish the magic of these last flame colored wheels of summer, rich with the tear shaped seeds of next season, and their promise of another summer. It’s time to build a fire in my masonry stove at night. The flames of Autumn have arrived. Sounds delicious, I will have to try it this weekend. It is fun to try new recipes as the cold strengthens. Keep warm.